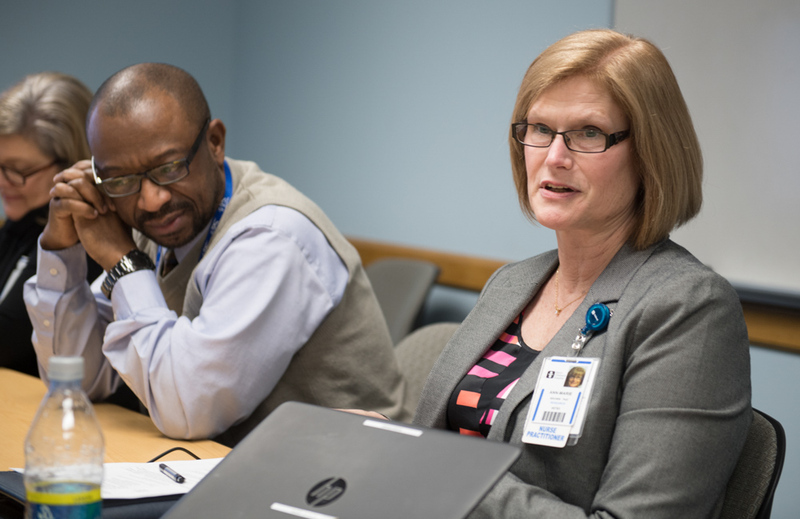 Ann-Marie Brown speaks in a Pediatric Intensive Care Unit (PICU) team meeting. Ann-Marie Brown‘s roots to Akron Children’s Hospital run deep. When she says, “This place is in my blood,” she isn’t kidding. Her mom, Mary Ellen Butler, the longtime clinical coordinator for the radiology tech school, worked at Akron Children’s for 22 years. And, over Ann-Marie’s own 30-plus year tenure at the hospital, she’s held 2 pioneering roles and poured her own blend of blood, sweat and tears into her work. Ann-Marie with a patient in the PICU. Starting as a nurse tech back in the mid-1980s, Ann-Marie accepted her first job as a RN in the Neonatal Intensive Care Unit (NICU) in 1986. 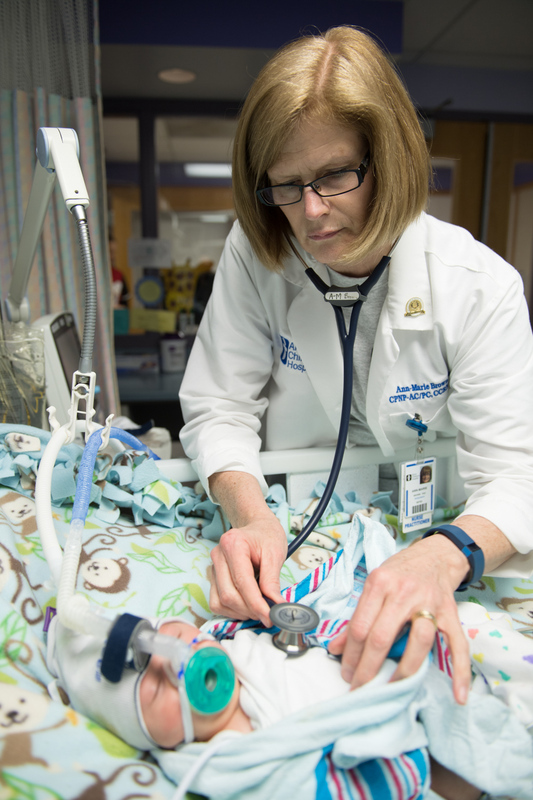 After stints as clinical coordinator and critical care transport coordinator, she became the first-ever nurse practitioner in the Pediatric Intensive Care Unit (PICU) in 2003 – paving the way for many others to follow. It was during her schooling to become a pediatric nurse practitioner that her love of research began to form, eventually leading her to pursue her PhD. In June 2016, Ann-Marie became the scientific and operations director for the newly created Center for Healthcare Services Delivery Research and Innovation of the Rebecca D. Considine Research Institute – a role she clearly relishes. Although the Research Institute was just founded in 2009, research has long been conducted at the hospital but not in a coordinated way. The goal now is to bring all research efforts under the umbrella of the institute. “One of our objectives is to bring investigators together where research may overlap so they can work together when it makes sense,” she said. Brown co-directs the Healthcare Services Delivery Research and Innovation Center with Dr. Sarah Friebert. She and Dr. Friebert meet weekly to identify focus areas for their center and are developing an evaluation tool to help score and vet research proposals. One of their goals is to create viable progress that eventually has a reach outside the hospital’s walls. Ann-Marie Brown meets with Dr. Sarah Friebert. While the majority of Ann-Marie’s time is focused on her leadership role and overseeing the research of others, she still makes it a priority to continue her own research as well. Currently, she’s leading a nationwide study of 8 PICUs to investigate the best way to reach goal feedings for intubated children aged 1 month to 12 years. 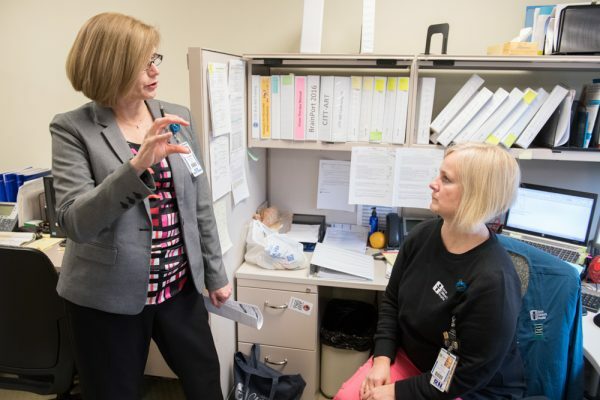 One of the ways she stays connected to her research is continuing her role as a PICU nurse practitioner a few days a month. She recently attained Level 3 status – the highest achievable, for her clinical, professional and community contributions to the nursing profession. “It’s important to me to practice at the bedside so I’m in touch with the issues facing our nurses and multi-disciplinary team and learning about the questions that need to be answered from a research standpoint,” she said. Brown starts most days at 6 a.m. on administrative tasks. The rest of her days are often filled with meetings. 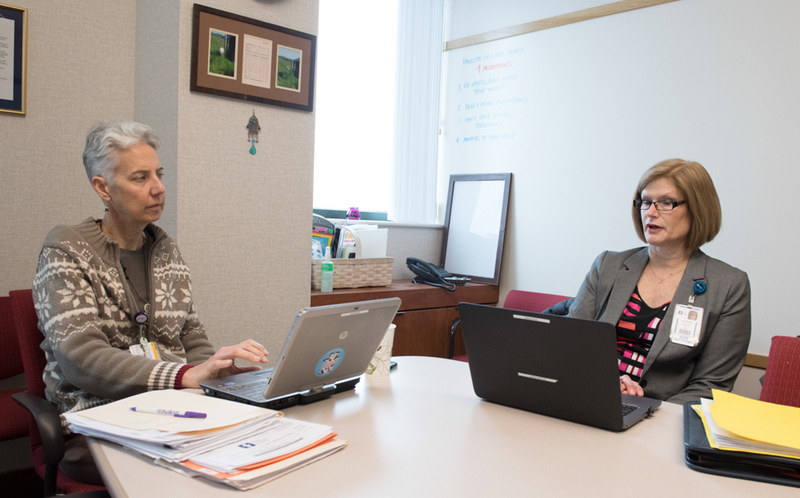 The Research Institute is in the final stages of selecting an electronic records system for study management to facilitate workflow and team communication through all phases of a research project. They also recently went live with an electronic Institutional Review Board (IRB) process that approves all human subject trials for safety and ethical practices. Ann-Marie talks with Kelly Culp, RN, clinical research coordinator for the Center for Vision Science. “It’s imperative that our research is conducted within regulatory guidelines,” Ann-Marie says. Brown shares an office, or the “bullpen,” as she likes to call it, with the 3 scientific and operations directors of the other centers. While some people might find the tight quarters a nuisance, she relishes the opportunity to bounce ideas off her colleagues. Today Brown is spending her afternoon in meetings. She first meets with the biostatistician on the PICU feeding study whose role is to dissect and summarize data and eventually share the information based on the findings. They discuss the recommendations they received from the Data Safety Monitoring Board, which includes reporting all adverse events – whether they’re related to the study or not. Ann-Marie’s other meeting today is with the PICU research team. The team is meeting with Dr. Sam El-Assal from the emergency department to offer feedback on his proposed study regarding respiratory failure, rapid sequencing of intubation, and the use of Vapotherm prior to ETT tube placement. 2017 promises to be a year of growth for the Research Institute. The search is ongoing for a chief research officer with hopes of having someone in place by midyear. Plans also include hiring more clinical staff, data management specialists and scientists. Learn more about the Rebecca D. Considine Research Institute.